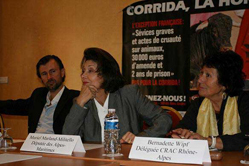 French anti-bullfighting group CRAC (Radically Anti-Bullfighting Committee) launched a billboard campaign in October 2009, along with 22 other partners, in Marseille to alert the public about the barbaric nature of bullfighting. The campaign was launched just days before the “fiesta des Suds” a major cultural festival in the south of France. Although Marseille has not had any bullfights since 1962, the city is at risk of being targeted by bullfighters who want to to re-introduce their blood sport in this major urban centre. Bullfighters already attempted to organize events involving bulls, such as bull runs, in 2005 and 2008. However they were stopped by Council law. Article 521-1 of the French criminal code prohibits cruel treatment of animals, but includes a paragraph – alinea 7 - providing an exemption allowing bullfights in towns with an “uninterrupted tradition of tauromachy”. According to recent decisions by French courts, such a tradition can be introduced by organising any tauromachic event, not necessarily bullfights. Thus, the bullfighting lobby managed to use bull runs as a “Trojan horse” to introduce bullfights in towns and cities where it had no previous history. 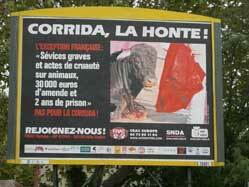 The CRAC campaign in Marseille aims to derail this strategy by mobilising the public against bullfighting. Over 140 giant billboards depicting the cruelty of bullfights were displayed throughout the city. The campaign is also making progress on the political stage. A member of the French National Assembly Muriel Marland-Militello has tabled a law to delete alinea 7 to end this outdated and unpopular sport in France once and for all. Project of law No 228 has already received the support of 51 Members, including some from the south of France, the cradle of the French bullfighting tradition. Ms Marland-Militello has asked the President of the National Assembly to put her project of law on the agenda of the Assembly. This initiative adds to growing awareness about the cruelty of bullfights in Spain where 70 cities have already declared themselves “anti-bullfighting”.